SPOGG member Dawn first pointed them out to us, and we've been following the adventures of the Typo Eradication Advancement League (TEAL) ever since. Newspapers and bloggers have covered the adventure, often observing that people like these "must be a nightmare at dinner parties." Manners columnists, too, have opined that it's extremely rude to correct the grammar of others. This gets us thinking... Why would it be annoying to have smart, knowledgeable people at your dinner parties? Has our society slid so much that we can only enjoy the company of others when they know less than we do? Since when is learning something new automatically a mortifying experience? We definitely understand how it could be embarrassing to have one's grammar and typographical errors corrected. That doesn't mean there aren't kind, thoughtful and sensitive ways to do it, however. Our readers catch our imperfections regularly, and when they are gracious, we are grateful. The blanket assertion that correcting grammar is universally rude is, we think, rather lazy. Is it similarly rude to point out to our friends when they have salad taking residence between their teeth? Or to alert them that their zippers have fallen? We let our friends know when these embarrassments happen because we wish to spare them greater embarrassment later. We do this kindly, gently, and with respect--and sometimes, even with humor. There is no reason we can't apply the same compassionate techniques with grammar. We don't have to correct everyone's errors. We don't have to do it all the time. But when we fear it will cause mortification or rejection, we do it out of kindness (when we are certain, of course, that we are correct in our correction). It is a fact that people are judged for their grammar. We have written before about surveys of hiring managers in England, in which hiring managers reported being more bothered by grammar errors than they were by candidates who cursed in interviews. Likewise, raise your hand if you're not just a little bit turned off by a personal ad littered with spelling and grammar errors. We might rail against this, saying that it's unfair and awful. In some cases, it no doubt is. To change this fact, however, we'd have to conclude that language standards are a bad thing. We do not believe this is the case. Language standards help us understand each other, across the room and across the span of years. Understanding is one of the fundamental challenges of humanity, and we're not about to discard a primary tool because of how we might come across at a dinner party. In any case, however, we are charming at dinner parties--much more so than Johnny Bag of Hammers. People, don't drink and make signs. Terrible things can happen to your apostrophes and spelling. Thanks to Lauren L. for having the presence of mind to nab this off the TV. Weaker viewers would have collapsed to the floor, as though inebriated with mirth (or Jell-O shots). Pardon the hideous scan, but we couldn't find our scissors. This is a Pepperidge Farm Goldfish bag, scrunched under the lid of our scanner. Note the marketing slogan: Think differently! Does that sound familiar? It should. It's a ripoff of Apple's "Think Different" campaign that irked so many grammarians way back when. Here's the thing, though. Apple's campaign is better. While it's true that we use adverbs to modify verbs, applying that rule slavishly here undercuts the inspirational message of the ad. If you tell someone to "think differently," then you're telling him his current mental mode isn't working. Is that a way to sell a product? We think not, unless insulting your customers is your plan. You can probably get away with this with children, who are used to taking orders from adults all day long. Ah, school. Yet another link between fish and kids. When you're frying bigger fish, though, telling your customers to "think different" is another matter. Here, "different" works idiomatically, if not strictly grammatically. Let's think of another example along these lines: "Think green." You'd never say "think greenly" if you're encouraging someone to think with an environmental focus. Likewise the "buy local" campaign wouldn't mean the same thing if it read "buy locally." The first means buy produce grown in your area. The second means to buy it at a nearby store, instead of online or through a remote catalog. Our language is flexible enough that you can communicate a big concept with just two words when you know the idiom. If you ignore this, you might end up saying something you really don't want to say, even if it's perfectly grammatical. In its defense, Pepperidge Farm really is encouraging its little customers to think about things in different ways--if you click to enlarge the photo, you can see that they've laid out fish silhouettes to spell a name and to make a cello. It's a fine lesson for kids, even if "think creatively" or "think imaginatively" would have been the more direct ways of delivering that message. Meanwhile, we're sending mental instructions to the marketers to "think semicolon" next time. The sentence "Be open minded, what do you see below?" requires a semicolon where the comma stands. A 14-year-old boy admitted on Friday to harassing a neighbor, pilfering cigarette butts from her porch and leaving poorly written notes she considered threatening. ... The neighbor ... showed three recent notes to the officer. Once read: "don't cope an atitod with me." Presumably, the note intended to read "Don't cop an attitude with me." When interviewed by the officer in front of his mother, the boy admitted to leaving the notes. Even with perfect spelling, the boy would have looked like a jerk. Is it worse, though, to look like a dumb jerk? Probably—and not just for the boy. A kid who reaches the age of 14 and hasn't learned to respect the neighbor is a sad case. One who reaches that age and hasn't learned to spell, either, is a kid who isn't interested in the bigger lessons. And that's just sad. At least he admitted his crime, though. That means there's hope for him. "We've had partial building collapses; we've had fires in buildings," said Stringer, "we've had cranes pummeling down shafts in buildings; we've had loss of life injuries [loss-of-life or fatal would have been better]. This incident is just the latest example of needless people dieing because we do not have proper safety protocols in this city." First, the people aren't "needless." We're sure their families considered them quite necessary. Dying "needlessly" would have been the way to say this. Second, it's dying. Not dieing. And certainly not dyeing (though that is the fate of a dozen eggs sitting in our refrigerator). "Dieing" isn't even a word, though we suppose it could be "verbed" to mean "using dice." In any case, we sincerely hope crane operators are more diligent about their inspections; otherwise construction in crowded urban environments really will be a matter of "dieing." John Mason, the man who was once engaged to runaway bride Jennifer Wilbanks, has gotten married -- to another woman. His father, Claude Mason, tells People magazine that John Mason married Shelley Martin in a quiet ceremony Saturday in Duluth. Claude Mason, who serves as an associate municipal judge and officiated the ceremony, says the family was very happy for John Mason. John Mason currently works as the general manager of a family medical facility in Duluth. His new bride, Martin, works in pharmaceutical sales. Claude Mason says the two met through Martin's cousin, who was a high school classmate of John Mason's. Now it's true that a good percentage of high-school students take drugs. But they should only be called high school students, without the hyphen, if we know for sure they're stoned. For all we know, though, that is a good state to be in when you're fixing up a man who had a really bad first-wedding experience. When Does SPOGG Love Bad Punctuation? SPOGG loves bad punctuation when it comes with really good salsa. For years, we've noticed the writing on this garbage can at our favorite neighborhood taco joint. It's a festival—nay, a fiesta— errors. And yet, the salsa at this place is so delicious, we completely overlook the punctuation. We count two unnecessary apostrophes, two superfluous sets of quotation marks, and one completely baffling comma. That's a lot of errors in a seven-word message. Two years ago we moved out of the neighborhood with this wonderful little restaurant. So when we were back in the area on Saturday, we had to snap a picture, just for nostalgia's sake. When we can't have the salsa, we can look at the picture, which makes us almost as happy. Q What are your thoughts regarding the appropriate use of the semicolon? Sen. Barack Obama: Our movement is real, change is coming to America and the time has come to use semicolons appropriately. Sen. John McCain: Although I've never minded the role of the underdog, we must get used to the idea that semicolons are the front- running punctuation mark. Huckabee: A lot of people have been trying to say this is a two-mark contest between semicolons and colons. Well, you know what? It is. And I like them both. "God people are batshit. And im not the one who is. and i hear now i am "Bi Polar" uhhhh...thats more nuts than I will ever be. I may be Eccentric, i certainly speak my mind and am slow to put out a record i need to mean the world to ME, and im sur ei am quite Nuerotic but "Bi Polar" . Thats just slander.I shoot straight from the hip and spellcheck has NOTHING to do with REALITY." While we can neither affirm nor deny spellcheck's relationship with reality, we would like to use this graphic from SPOGG member Amanda D. It's a screenshot of a message her spellchecker gave her while she was working on a complex 250-page document. It captures the reality of Courtney Love's blog messages with more insight than we thought software could possess. Craig Conley sends this funny photo along, along with the observation they might want to consider the wording on the bumper sticker a bit... further. Deciding whether to use farther or further can be tricky. Generally, we use "farther" with distance--both literal and figurative, and further when we're talking about degrees. So, you drive your minivan farther down the highway, but you discuss things further when you're stuck in traffic. According to James Kilpatrick, "farther" is a typographical error. The original word, he says, is further. Most people intuitively know when to use farther and when to use further. No one says, "Let's discuss this farther." Likewise, "farthermore" isn't a word you hear every day, and the only people who say, "It isn't fur from here" are cartoon roosters (either that, or surprised mink trappers). When in doubt, "further" is probably the safest choice, because you can always say it's the older word. After you chooose your plan, you can leverage our guided communication process to make sure you get face-to-face with the right people. In a way, it's artful use of jargon. What do people want from a dating site, other than some literally face-to-face contact? Also, please note that was a rhetorical question. We can imagine what else people want, but we prefer not to. "When seeking an evening date, a weekend travel companion, or a friend to accompany you to your next business or social event, our Icon Models are paramount preference." Paramount preference? Do they mean pair-of mounts? Did we just type that? So sorry. In our juvenile lather over this subject, we almost forgot to mention the dangling modifiers that open the sentence. The whole dirty business did get us wondering about the difference between a prositute and a call-girl. The Oxford English Dictionary comes to our rescue, once again, explaining that a call-girl is a prostitute who makes appointments by telephone. So it sesems we need a new term for one who is summoned by e-mail, text message, or Web form. iGirl? WWWgirl? Dot-ho? Clearly, we'll have to give this some thought. March 9, 2008 · Call it fuddy-duddy, but indulge me in a few pet peeves about language usage by politicians, and yes, the media. This with a bow to my friend Bill Safire, the reigning usage maven. First, the Obama and Clinton camps recently squabbled over an ad showing a hypothetical 3 a.m. phone call to the White House asking: "Who do you want answering the phone?" Whatever the crisis, I would like them to say, "Whom do you want answering the phone?" Grammar 101. Ernest Hemingway didn't write For Who the Bell Tolls. Then the word "nation." The media report that President Bush has landed in the nation of Liberia. No, he has landed not in a nation, which is a social concept, but in a country, which is a geographical concept. The nation may also have organized itself into a state. But you land in a country, not a nation. Then a phrase which is on its way to becoming a cliche: "up for grabs." In its original meaning, "up for grabs" was meant to denote some disorganized situation in which there was no way to tell who might end up with a majority of votes or supporters. But "up for grabs" has evolved into a catch-all phrase for "in contention." It is customary now to hear that "so many convention delegates are up for grabs in the primary contest." They are not up for grabs. It is known who the contenders are. There may be so many delegates at stake, but they are not up for grabs. Finally, the commonly used "protest of" some action — wrong. To protest is to proclaim or announce, as methinks thou dost protest too much. What you mean is to protest against. I'm not sure how many people care about language usage in the political arena. But I would like to see a little elegance in the words of politicians and the media. We have no idea when the first thought happened. We can, however, say that the Grand Canyon is clearly deeper than many of our own thoughts, and certainly deeper than the ones that make us laugh really hard. The danger of calling this the last post is that we will remember something we've forgotten for the moment. We'll not worry about this. We're not the Society for Truth in Blogging (though we wouldn't mind is someone formed one). We just wanted to make sure everyone read John McIntyre's blog post at the Baltimore Sun Web site. He wrote so much about National Grammar Day, and with such wit and wisdom. We hope you will bookmark his blog and visit it regularly. You'll be entertained and educated by a first-rate editor. National Grammar Day in PB&J. Could there be a more tasteful way to celebrate? We can't imagine. Thanks to Jason and the team at Costco for sharing this photo. It's proof that companies can take care of their employees, deliver value to their customers, and do it all with a great sense of humor. We think it's safe to assume that President Bush hasn't yet heard that he won a SPOGG Award for being the celebrity with the worst grammar. This letter arrived by Federal Express today. In it, President Bush sends his greetings and good wishes. Couldn't he have sent this before we complained to a local reporter that our "Dear Mr. Bush" letter had gone unanswered? Now, we feel petty and mean--even more than usual. And we must say, with the exception of the needlessly capitalized "Nation," we find no flaws in his letter. In return for his thoughtful and correct correspondence, we wish Mr. President a Happy National Grammar Day, and we congratulate him on winning this particular election in a landslide. He really is a uniter! We have proof! We are enjoying this thread. Our favorite local television station has a great written piece about National Grammar Day. The blogs you see below are the real stars of National Grammar Day. Please visit them, and if you like what you see, bookmark them, or subscribe to their feeds. Enjoy! Learn how journalists write at Newsroom 101, which has 1,650 or so free exercises in Associated Press Style, which governs most newspapers. The 246,000 members of her Facebook Group (I Judge You When You Use Poor Grammar) can't be wrong. This public radio show, featuring Martha Barnette and Grant Barrett, is a treat for people who love language--and have a grammar pet peeve or two. The CPA mom reviews books, products, Web sites and whatever else catches her eye. A fifth grade teacher reviews literature here. A Christian mom and atheist dad agree on one thing: homeschooling their kids. This is their blog. Freelance writer and former columnist Joanne Jacobs writes about education here. Stay-at-home moms blog about life with kids. A teacher blogs about life in the classroom. Bud Hunt is an instructional technologist in Colorado. He blogs here about better teaching. A blog about how new technology can help in the classroom. More creative ways to use technology in the classroom. About engaging students in their learning. The culture, history, and role of information in learning. A homeschooling mom on how she does it. A weekly Webcast on life in the classroom, by four different teachers. 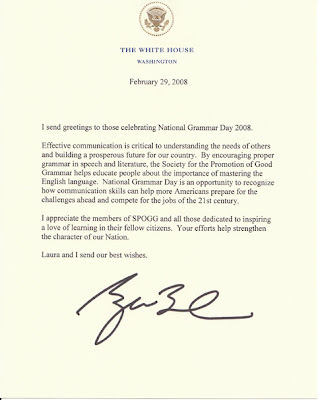 March 4 is National Grammar Day, and as part of our festivities, the Society for the Promotion of Good Grammar is handing out SPOGG Awards to the U.S. city and to the U.S. celebrity with the worst grammar. The City with the Worst Grammar in the U.S. This year, the award goes to Columbia, South Carolina, where spelling is monumentally bad—at least in one particular cemetery. SPOGG member Chris Cole sent in the winning photo, which won by a substantial margin. The Celebrity with the Worst Grammar in the U.S.
SPOGG thanks its members for their submissions and votes. SPOGG would also like to note that this contest is completely unscientific, and that the SPOGG Awards have a cash value of less than 1/20th of a cent. Every so often, you read posts by linguistic types arguing that grammar and clarity have nothing to do with each other. Sometimes, that's true. Even though "I feel badly" isn't grammatically correct, its meaning is clear enough. We just read, however, that gun violence costs us $100 million a year. How much of that could we have avoided had the Founding Fathers been a bit more careful with their modifiers, or if earlier scribes had left the original punctuation intact? This graphic comes from the Virginian-Pilot. Click here for the story. To all those who argue that grammar and clarity are separate pursuits, we respond with this example. How long will the dispute go on? The thing is, people rarely intend to be unclear with their writing and speech. The rules of grammar do, however, give a good framework for determining meaning. When the author of a statement is no longer alive to explain it, we can apply the rules and translate as well as we can. When those rules aren't followed, it becomes guesswork. Good grammar doesn't guarantee you're saying anything worth reading. But we can't think of a better way to ensure people your words are understood.